iradiophilly | News - El-Shabazz Running for DA; Man Found 2 Days After Home Invasion; 2nd Kidnapping in New Castle Co.
El-Shabazz Running for DA; Man Found 2 Days After Home Invasion; 2nd Kidnapping in New Castle Co.
Tariq El-Shabazz has officially announced he is running for Philadelphia District Attorney. He kicked off his campaign on Monday. El-Shabazz resigned from his post as First Assistant District Attorney last week after current District Attorney Seth Williams announced he would not be seeking re-election amid recent ethics violations and a FBI investigation. 52-year-old El-Shabazz worked as an assistant District Attorney in Philadelphia from 1988 to 1993 and even recruited Williams to the office. He left to become one of the more prominent defense attorneys in the city. Williams lured him back to the DA's office in September with a job running the Special Investigations Unit and as his top deputy. The field is crowded for this election (which happens at the Democratic primary May 16th). 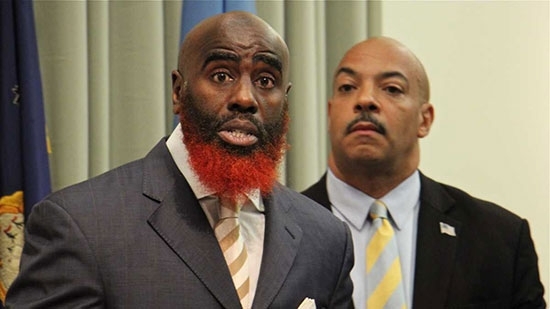 Including El-Shabazz there's defense attorney Lawrence Krasner, former prosecutor Joe Khan, former Municipal Court Judge Teresa Carr Deni, former Philadelphia Managing Director Rich Negrin, and former prosecutor Michael Untermeyer. Philadelphia Police are investigating after a man was found bound and gagged in his home two days after a home invasion in the Juniata Park neighborhood. It started on Friday around 11 p.m. in the 4200 block of Neilson Street. The 50-year-old victim was working on engines in his shop when two armed and masked men entered through the open garage door. The men dragged him to a second floor bedroom, tied him up with electrical tape, and stuffed a rag in his mouth. They proceeded to beat him with a pistol before leaving him there. It wasn't until Sunday evening, when the victim missed a family function, that his brother went to check on him. He climbed up and entered through a second floord window and found him. The victim was taken to the hospital and remains there in stable condition. Police are using surveillance to identify the suspects.